The waiting list for organ transplants is growing at an alarming rate while the number of potential organ donors has failed to keep pace. Encouragingly, scientists are working several high-tech solutions in the field of regenerative medicine. We spoke to the experts to learn how organ shortages will soon become a thing of the past. Organ shortages are a growing health concern. Each year in the United States there are approximately 28,000 transplants, with 120,000 people stuck on waiting lists. Tragically, most people on the wait list die before they ever get an organ. 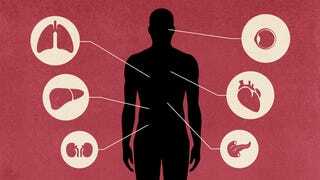 Furthermore, it has been estimated that 35% of all U.S. deaths — about 900,000 — could be prevented, or at least significantly delayed, by organ transplantation. Internationally, the World Health Organization says organ transplants are currently achieving less than 10% of the global demand. Looking at kidneys alone, about 25,000 people die each year waiting for a donation. And as New Organ founder Dave Gobel told io9, there are approximately two million estimated individuals in Europe, North America, and in the British Commonwealth who need replacement organs but don't show up anywhere on waiting lists because they're "deemed by the medical establishment to be 'not a transplant candidate' due to reasons such as having or having had cancer, being too old, and other triage-based disqualifiers." At the same time, 95% of Americans support organ donation, but only 40% are registered organ donors. There's also the issue of how organs are procured today. "For someone needing a heart/lung transplant, someone must die for them," says Gobel "Imagine being in a situation where you must hope someone dies so you can live." Compounding the problem is that even for the fortunate few who do receive an organ donation (aside from those who receive a kidney), there are severe constraints on the quality of life after an operation. Many face a lifetime filled with the need to take auto-immune suppression drugs to stave off organ rejection, while the same drugs also lower their overall immune competence. "If all of that works out, they will still be facing the fact that transplant organs will often need to be replaced within 10 years of implant," says Gobel. "A ticking time bomb of life. Better than death for sure, but wow, what a life." New Organ, a collective initiative hosted by Methuselah Foundation (a biomedical charity) and managed by the Institute of Competition Sciences, is currently raising awareness and facilitating research initiatives to help alleviate the shortages, including the New Organ Liver Prize — a $1,000,000 award to the first team "that creates a regenerative or bioengineered solution that keeps a large animal alive for 90 days without native liver function." The organization is currently working on a number of other related initiatives, including a shared roadmap, a prize portfolio to stimulate key breakthroughs, and a growing network of partners. Indeed, as the biotechnology revolution takes shape, a number of solutions are emerging, including the ability to regenerate whole organs using stem cells, bioprinting tissue, and developing artificial and assistive organs. What's more, we'll soon be able to reliably preserve these bioengineered organs for when they're needed, such as in an emergency. (This prospect is being catalyzed by the Organ Preservation Alliance, a founding partner of New Organ.) Taken together, these advances will do much to meet the growing demand for replacement organs. One of the most exciting avenues of research in this realm is regenerative medicine. This line of inquiry is particularly promising because it leverages the body's innate capacity to heal and defend. So rather than having to depend on an organ donor, patients will eventually be able to receive a bioengineered organ tailored just for them, or use cellular therapies to restore normal function. Indeed, regenerative medicine will result in multiple improved approaches to tissue and organ regeneration, replacement, and restoration. A prime example is the work being done by Dr. Stephen Badylak at the McGowan Institute for Regenerative Medicine, a program of the University of Pittsburgh and UPMC. His team is currently working on a viable liver for transplantation. "The first liver transplants were done decades ago and we have an excellent record with liver transplants in general," Badylak told io9. "So you might expect among the organs for organ engineering that we're using the liver as a template — and it's not just because of the history, but because the liver has a lot of regenerative potential on its own, and probably has the best chance for early success." At the McGowen Institute, researchers utilize an array of approaches as they work to restore functional tissues, including cell based approaches, the development of bioactive molecules, and cell-based, or stem cell-based, therapies. Consequently, the institute has a good history of developing artificial organs for organ assist, such as liver dialysis and cardiac assistance. "Organ engineering, however, takes it to the next level," says Badylak. "That involves the development of a custom-designed organ — a liver, heart, kidney, or lung — and it would be available 'off the shelf' for a patient who needs one, for whatever reason." "It's pretty exciting," he says. "The reason I'm high on this is because the only thing lacking in taking this to patients are resources. It's not like some major breakthrough in science is required to make this work — we've got all the pieces, parts, tools, and know-how. It's just a matter of figuring out the right combination to get this implemented in human patients." Badylak estimates that about $10 to $30 million is required to make it happen, which he says is not very much in the large scheme of things. "The fundamental concepts upon which this approach is based are already understood," he says. "We know how to harvest a 3D scaffold for any organ. We can take a liver, lung, heart, or kidney and remove all of the cells from that organ so that you're only left with the scaffold of the material that the cells resided upon. The scaffold material does not contribute to the rejection, yet it represents the perfect home for those types of cells. It's not a safety issue — we know how to do this." The second part of the process involves the reintroduction of cells. The researchers take a patient's cells, such as a skin cell or a muscle cell, and convert it into a stem cell that can be driven along a particular line of differentiation. This way, a stem cell can be coaxed into becoming a liver cell, or a kidney cell, a heart cell, or whatever is required. "We know how to do that," says Badylak. "Now it's just a matter of saying, let's put these patients together, and let's learn how to align the appropriate blood vessels so that when they hook the plumbing up to the patients we don't get clots forming. These are very doable things, it simply takes a coordinated effort, and a little bit of research. This is why I'm convinced this is going to happen." Badylak is right to be encouraged. Back in 2013, biologists transplanted a functional lab-grown kidney into a live animal. Indeed, the advantages of this approach are substantial. As New Organ's David Gobel told me, regenerative medicine is industrializable and determinative. "They are amenable to robotic implementation, and thus can be low cost," he says, whereas "traditional medicine is about personal triage, temporary arrest of decline at enormous unconscionable costs that are bankrupting the globe." Regenerative medicine, on the other hand, "is predictive, restorative, efficient and socially, ethically, medically and in all other ways just better." Another hugely promising area in regenerative medicine is the process of 3D bioprinting. A leader in this area is Organovo, a San Diego-based medical lab and research company currently developing functional, three-dimensional human tissue via 3D bioprinting technology. The bioprinting process first involves the identification of the structural and compositional elements of the tissue that is to be printed and the creation of a viable design that can be utilized by the printer. Following this stage, a bioprocess protocol is developed to build the multi-cellular building blocks — which are called "bio-ink" — from the cells that will be used to generate the desired tissue. A bioprinter then dispenses the bio-ink in a layer-by-layer (or additive) manner. Sometimes a bio-inert hydrogel is used for support as tissues are constructed up vertically to achieve three-dimensionality, or as fillers to create channels or fill spaces like in normal tissue. One person who's looking to leverage the power of bioprinting is Dr. John Geibel, the vice chair of surgery and professor of surgery and cellular and molecular physiology at Yale School of Medicine. He told me that bioprinting is poised "to change the way medicine is done in that, with the ability to print replacement vessels and eventually organs such as the liver, we will have the chance to save thousands of more individuals who are critically ill and on long wait lists for organ replacement." Geibel's particular area of research is gastrointestinal disease, so he's very interested in the idea of developing a replacement for the small intestine and developing a liver replacement. "The intestine is one of the most difficult tissues to repair and replace due to its delicate nature and sensitivity to fluctuations in oxygen and also to neurological disturbances during surgery," he says. "The liver has now become much easier to transplant with the many advancements in technology and surgical techniques but the key problem is the continued shortage of viable replacements so that many individuals are forced to suffer for years while waiting for their transplant." To that end, his team is hoping to develop a bioprinted organ that will be used as an "assist" organ that can be implanted and help the patient with their failing liver. This assist liver, or "liver patch," is not intended to fully replace the failing liver, but will keep the patient in a better state of health while waiting for the transplant. Importantly, we're also going to need to find a way to store these organs for future use. As Gobel told me, the 3D liver assays can live for 42 days, but a heart for transplantation can currently be stored on ice for only 4-5 hours, and for lung tissue the cold ischemia time is around 4-6 hours. "Such ridiculously short 'use by' times causes an embarrassingly and deadly proportion of transplant organs to simply go bad before they can be allocated, delivered and transplanted into a recipient," he says. "The ability to store organ-sized tissues for at least 40 days would improve inventory and thus organ matching and thus medical and life outcomes for recipients." The ability to cryopreserve organs would result in numerous lives saved, better medical outcomes, lower costs, faster medical progress, and even better emergency transport systems, including UAV-based ambulances. In such a world, we would be able to maintain "back-up copies" of each of our organs in the event they'll be needed later. From a technological perspective, we're getting close to being able to pull this off. Already today, stem cells, sperm, eggs, and embryos are cryopreserved for long-term banking. Regular advances in ice blocker, cryoprotectants, and vitrification are now making it possible to preserve arteries, veins, heart valves, tracheas, cartilage, corneas, and even organ slices. Encouragingly, progress is being made with the preservation of rat hearts, pig and rodent livers — and even the remarkable cryopreservation and transplantation of a rabbit kidney. The importance of this research has not been lost on the U.S. Department of Defense who, back on January 14th of this year, announced government grant programs for organ banking transplant research initiatives. Through its Tissue Injury and Regenerative Medicine program, the DoD hopes to fund 20 or more leading U.S. research teams, with some labs receiving as much as $3-$3.5 million across the first two phases. The grants are to "support U.S. commercialization of science while achieving military as well as civilian health goals." "People seem to underestimate what could be coming. This is a big step towards a future in which we routinely replace damaged organs and tissues to restore both form and function, in a way that only transplantation allows — replacing 'like with like'," noted Dr. Gerald Brandacher of Johns Hopkins in a statement. "The ability to build real organ and tissue banks could transform the entire field of transplantation. This commitment from the DoD is taking us one step closer to that reality." I asked Gobel and Geibel what we can expect in the coming years and decades. "We already have liver assays, but in about about 12 to 18 months there will be the equivalent toxicology and pharmacokinetic test assays for kidneys," replied Gobel. "By 2019 there will be clinically relevant tissue patches for livers. It is likely that the thymus will be able to reboot the immune system's competence within eight years. We can expect the first fully engineered bioidentical no-immune-suppression-needed organ transplant in humans within 10 years. About 25 years from now we will see the first rough examples of the 'Leeloo Chamber' as seen in the movie The Fifth Element." Geibel hopes that by the 2030s we'll be able to 3D print new livers and intestines for patients in need, while dramatically reducing their wait for an organ to just the time necessary to print the replacement from their own cells. "Furthermore, since the replacement organ is coming from their cells there will be no rejection issues and thus it will eliminate the need for the anti rejection immunosuppressant drugs. We will no longer worry if a child adolescent or adult needs an organ, because we can print an organ that is a perfect match in cell type and shape so that surgical times should go down, and risk for rejection will be gone," Giebel told io9. "I look forward to this exciting time ahead."